Bears Stadium was sold for $23.5 million in 2016 to developers Lotus Equity Group, who chose Vishaan Chakrabarti of PAU to lead the master plan. Is it finally Newark’s time to shine? Recent projects, like James Corner Field Operation’s Passaic Riverfront Park revitalization and now the redevelopment of Bears & Eagle Riverfront Stadium, have slowly been pushing the city into developers’ line of sight. Ever since the minor league Newark Bears baseball team folded in 2014, the stadium once touted as a “saving grace” has been left largely empty. It was then sold for $23.5 million in 2016 to developers Lotus Equity Group, who will lead the redevelopment of its site in hopes that the project will spur a revival of the city’s downtown. What will be replacing Bears stadium is a dense, mixed-use development made up of residential, office, retail, and cultural space, with an emphasis on community-centered programming. 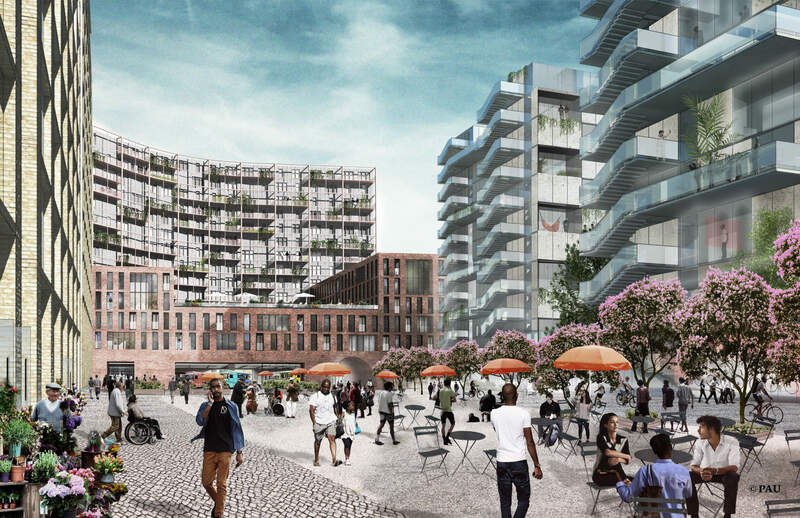 Two housing blocks and one commercial office block will make up the master plan’s superblock; a piazza in the middle will hold retail shops and host public programs. There are also plans to bring another cultural venue into the site, which will tie the development back into the city and the surrounding institutions.